"Everything was unrecognizable. 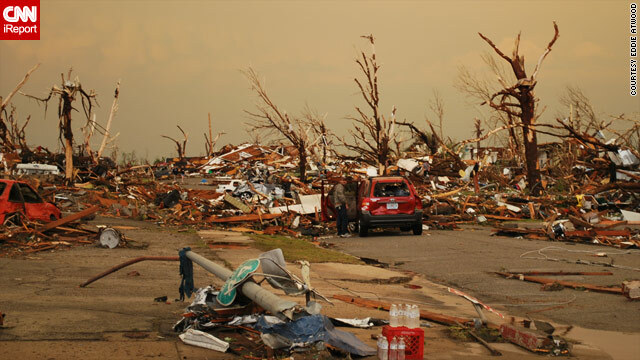 Completely unrecognizable," one Joplin, Missouri, resident said. [Updated at 3:27 p.m. 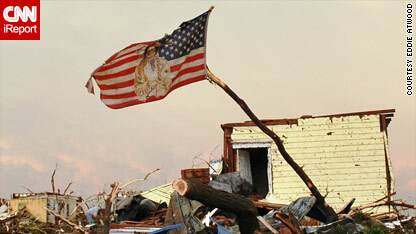 ET Tuesday] At least 118 people died from a tornado that tore through Joplin, Missouri, on Sunday, Missouri Gov. Jay Nixon said. The tornado hit a short distance from the house that Jeremy Cooper of Joplin, Missouri, shares with his family. "It started on 10th Street and I live on 7th Street," he said. Cooper said sirens alerted him to what was in store - but not really. "I could hear the tornado," he said. "When the first siren went off, 'cause it went off twice, you could hear in the air, the wind like a train." "We just covered up in the basement real quick," he said. The churning winds quickly died down, only to be replaced by another sound, Cooper said. "I came back up, the weather had stopped being so crazy around our house. The police sirens just started going crazy, all the power was out in town." Tulsa, Oklahoma, resident Theresa Campbell was visiting friends in Joplin when the twister tore through the area. 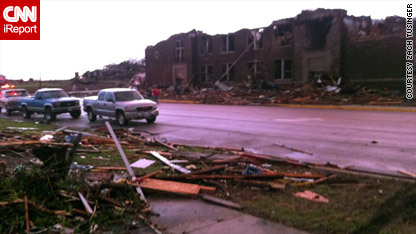 She took photos of the destruction around Joplin High School, which "was demolished," she said. "The photos, while quite graphic, do not show the devastation that this town is feeling," Campbell said. "Many families displaced. Many businesses and lives lost. It's truly heart wrenching." Tussiona Mikell was at the cashier's register inside a Dollar Tree in Joplin, Missouri, when a friend called her to tell her a storm was approaching. Mikell and five others waited out the storm in the cooler. "We could just hear things caving in but we couldn't see what was going on," she told CNN. "There was a lot of calling on Jesus. People were crying, saying different things. I was calling out 'Jesus, Jesus, Jesus.'" Finally, after about 45 minutes, the group tried to make their way out of cooler. But it wouldn't budge. "The ceiling fell down and blocked the freezer," Mikell recalled. "Everyone was trying to push to get (the door) cracked open. But we couldn't get it wide enough to get us out." The group all tried pulling out their cell phones - but couldn't call for help. They had no service. Then, the smell of gas started to pour into the freezer, Mikell said. The group feared the stores gas line had broken. With the walls of the store mostly destroyed around them, they were able to see through the crack they had made in the freezer and shouted to a passerby for help. "Everything else around was destroyed," she said. "We were hollering, 'Help, help, we're stuck.'" That's when Mikell heard about the massive damage and injuries at Walmart. "There was so much debris," Mikell said, recalling what she first saw when she stepped outside. "When I came out, everything was demolished. It's unbelievable." Jennifer Parr, 30, a student in Joplin, Missouri, knew the tornado was coming so she got her dog and got into her car to drive as far way as she could. "(I) made a last minute decision to get my dog and myself in my car and drive out of town when the storm/tornado hit," she told CNN's iReport. "I just barely made it out of town as the tornado was plowing through." Monday morning, as she came back to see what was left behind and what was destroyed, she saw her house was gone. What she saw around town - and took pictures of - when she returned was shocking. Near the St. John's Regional Medical Center parking lot and on Maiden Lane and 26th Street little besides debris remained. Zach Tusinger, 26, an attorney in Joplin, Missouri, lost his aunt and uncle in the tornado. They lived five blocks from St. John's Regional Medical Center. Tusinger heard the noise of a freight train from his parents' house but there wasn't enough room in the garage for his car, so he took off to his loft on the other side of town. On top of the same loft rooftop he took a picture of Irving Elementary School that he sent to CNN iReport - which is now destroyed. "The school was gone. There’s a Catholic church just to the west that was leveled," he said. He posted the picture on Facebook - but he had no idea it would serve as a warning to his family and elicit their last words to him in response. “My aunt was a pretty avid Facebooker and she posted about the time I was taking the picture … she posted, ‘Oh my god’ on Facebook," he said. "It's crazy because those are her last words." Ryan Atkinson, a sports writer for the Joplin Globe, was at work when the tornado hit Sunday. He and another reporter ventured over to St. John's Regional Medical Center within an hour of the tornado and were shocked to see the devastation. In the video he sent to CNN iReport, you can see hundreds of damaged homes across the street from the hospital. Atkinson hadn't seen his home yet, but his parents checked on it and told him that the roof is gone and it’s not habitable. He was preparing to go to his house to see it for the first time. Eddie Atwood, 46, a freelance photographer and iReporter who lives on the north side of Joplin, said it all began with a lot of wind and hail. “I just barely missed being right in the path of that tornado, like minutes from being there," he told CNN. Atwood said it started looking so bad that he almost took refuge in a car wash.
"I decided not to, and it was a real good thing because (the tornado) just tore it up,” he said. "There were power lines down all over the place ... You could smell fuel and natural gas, there were fires starting all over the place, they [the National Guard] were trying to get everyone out," Atwood said. "You couldn’t (have) picked a worse part of town. It cut right through where the hospital was, and houses after houses, apartments - it couldn’t have picked a worse place." On Monday Atwood and a friend went to see the damage. As he walked along one road he could see exactly how the storm destroyed an entire area. "I was walking down Main Street; everything was so razed over, it was disorienting because some of the streets you couldn’t even tell where you were at. After living in Joplin all my life, it was like living in the Twilight Zone." Debris was everywhere, he said - except for a lone flying American flag. "It just looks like a war zone. The whole horizon got flattened," he said. "It was a really tragic day. I’ve been here all my life. We’ve had some bad storms, but nothing like this. It’s taken a significant toll on Joplin." The Rev. C.J. Campbell was at home with his foster sister when the tornado, which he describes as an "evil monster vortex," hit his home at 5:55 p.m. CT.
"My foster sister and I were completely surrounded by a collapsed 1,800 square feet house within 60 seconds," he told CNN. "First began the low roar in the distance, and then it got louder and louder until it sounded like 50 semi tractor-trailer trucks going 70 mph about 10 feet outside the front door. The floor began to vibrate and then shake very violently and then seemingly buckle." "We thought we were going to be sucked up the chimney," he said. Despite the fear as it happened, and his emotions after seeing the home destroyed, Campbell walked away with a positive attitude. "I feel grateful to be able to talk to you," he said. Isaac Duncan was nearby in Carl Junction, Missouri, when he heard reports that the tornado was literally around the block. So he and a friend ran into the closest place they could find - a convenience store. "When we went in the electricity was already out there and were about 20 people huddled down," Duncan told CNN. "Everyone was just deciding what to do." Video shot inside the fridge shows little - it is dark and hard to see - but the screams and shrieking pleas for "Jesus, Jesus," "heavenly father," and "help" can be heard. The tornado ripped through the store - and even part of the refrigerator. "Basically the only thing left standing was the cooler that we were in," Duncan said. "Everything around it was gone. (The tornado) actually tore a few holes in the refrigerator. That's what we crawled out of." 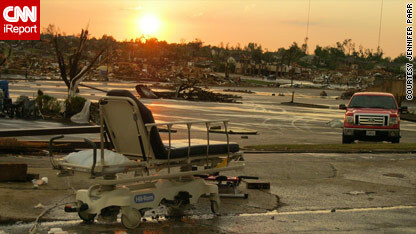 Sara Ferguson was near Joplin's St. John's Regional Medical Center after the storm hit. Denise Neil and Jaime Green, a reporter and photographer for the Wichita Eagle, were driving along with Neil's 6-year-old daughter Lexi near the medical center when the storm hit. "The rain was going in circles. The roofs of buildings were coming off," Neil said in a Eagle report. They pulled off the road and took cover in a carport of a medical building, according to the report. For many, the destruction was unimaginable. Joplin resident Jeff Law gave this description to the Springfield News Leader. "I've lived in this neighborhood my entire life, and I didn't know where I was. Everything was unrecognizable. Completely unrecognizable. It's like Armageddon," Law said. The Wal-mart in Joplin was ripped apart. 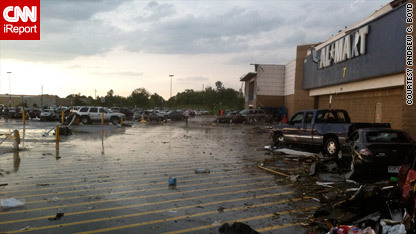 Schlesselman said he and other employees and customers freed those trapped by debris and left the wreckage of the store. "I don’t know how many got out. I just know that everyone in our area did," he told the Globe. Globe reporter Jeff Lehr told CNN affiliate KMBC-TV that he took shelter in a basement closet at the storm roared through. "You could hear everything go. It tore the roof off my house, everybody's house. I came outside and there was nothing left," KMBC quoted him as saying. "There were people wandering the streets, all mud covered," he said. "I'm talking to them, asking if they knew where their family is. Some of them didn't know, and weren't sure where they were. All the street markers were gone." I wish all of you the best of luck in Joplin. I live no where near you nor have I ever been to the city there but I do sincerely hope that you may rebuild and be able to move on from this tragedy and continue on to become stronger.